© 2002, © 2018 by Paul Freeman. Revised 12/19/18. A 12/28/70 USDA aerial photo (from the University of FL Digital Library Center / University of FL George A. Smathers Libraries, courtesy of Brian Rehwinkel). depicted Opa-Locka West as having 2 paved runways. which in the late 1960s was one of the busiest civilian airports in the world due to flight training activity. and consisted of two 3,000' paved runways with turnarounds at the ends and a small ramp area to park or check an aircraft. Limited landside access & a lack of airside facilities for based aircraft were a result of the airport’s designed function. The airport consisted of a 420 acre property. was a December 28, 1970 USDA aerial photo (from the University of FL Digital Library Center / University of Florida George A. Smathers Libraries, courtesy of Brian Rehwinkel). It depicted the field as consisting of 2 paved runways. 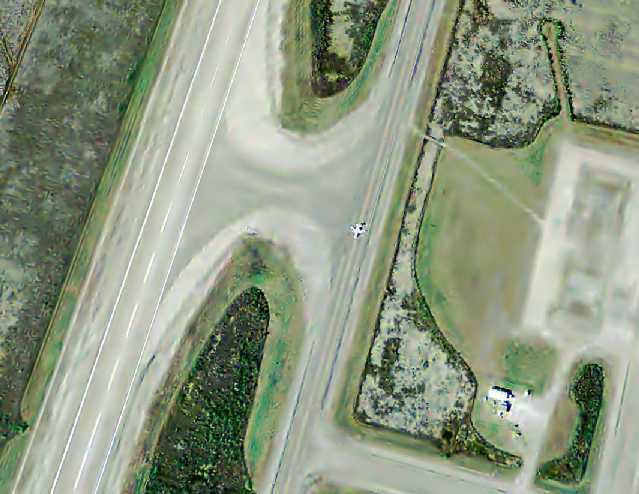 which clearly showed a road leading onto the airport from the adjacent West Okeechobee Road. 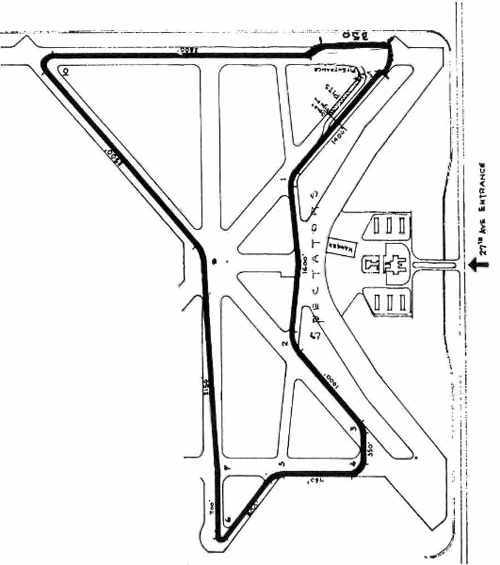 The 1973 USGS topo map depicted Opa-Locka West Airport as having 2 paved runways & a small paved ramp. The earliest photo which has been located of an aircraft at Opa-Locka West Airport was a 1977 photo of N5641V, a Piper PA-28-161 Cherokee. was on the September 1980 Miami Sectional Chart (courtesy of Mitchell Hymowitz). It depicted Opa Lock West as having 2 paved runways, with the longest being 3,000'. 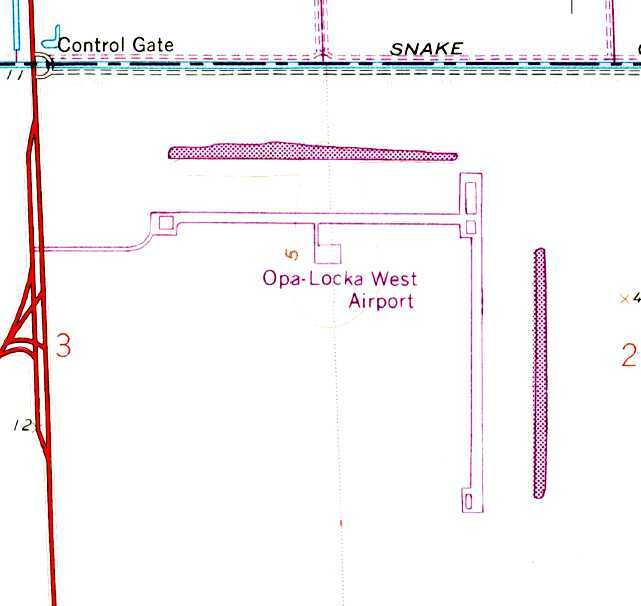 The 1988 USGS topo map depicted Opa-Locka West Airport as having 2 paved runways. Note the appearance of the quarry to the southwest (not yet present in the 1970 photo). This quarry would grow over the subsequent years, and eventually provide the “rationale” for closing the airport. 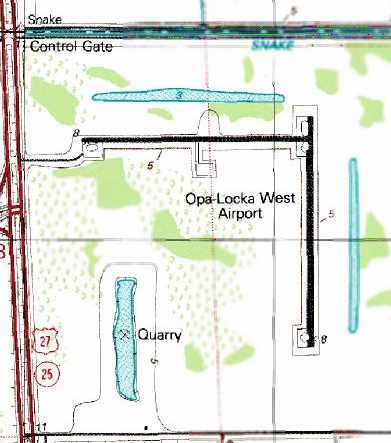 depicted Opa Lock West as having 2 paved runways, with the longest being 3,000'. were a series of 1994 photos by Chuck Clapper taken during the filming of the movie “Drop Zone”. Chuck Clapper reported, “A lot of the movie Drop Zone was filmed at Opa-Locka West. There were temporary buildings, a ferris wheel, and a number of airplanes operating there. Everything was put up by Paramount for the movie then taken down. Scott Levy recalled, “ I was a stagehand & construction helper for the movie 'Drop Zone' which was shot at Opa Locka West Airport [in 1994]. The largest aircraft that use Opa-locka West Airport regularly are light twin-engine aircraft such as Cessna 310s. The current Airport Reference Code for Opa-locka West Airport is B-II. There are no based aircraft & no storage facilities at the airport. Opa-locka West Airport has limits to growth because of the presence of wetlands on the property. and parallel taxiway to Runway 9/27 in anticipation of future landside development for FBO & flight school activity. Currently, the airport does not have a master plan. 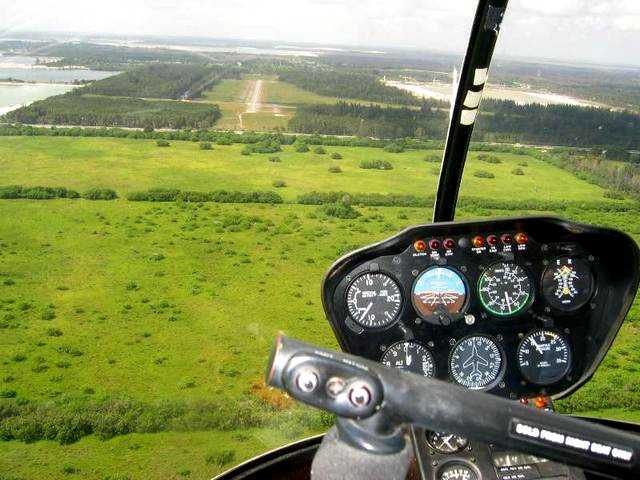 Opa-locka West Airport accommodates high training activity & limited military activity. General aviation operations [takeoffs & landings], 2002: 12,100, 2007: 12,406, 2012: 12,719, 2022: 13,369. There are no buildings or facilities, and there is no public access to the airfield by land. I worked for a banner towing company that operated out of there from 1996-2000. Weekend operations would have us making sometimes up to 8 or 9 round trips in & out of there per plane each day. Gerard continued, “It has a very personal place in my heart for many reasons. Flying banners was my first flying job after getting my Commercial Pilots License. In that respect, the memories are fond. as in late January 1998, I watched a very good friend crash & die after a botched banner pickup. The crash site is in the muddy grassy area in the northeast corner about 50 yards from the runway intersection. Gerard continued, “Opa Locka West was featured routinely during the filming of Miami Vice [1984-89]. 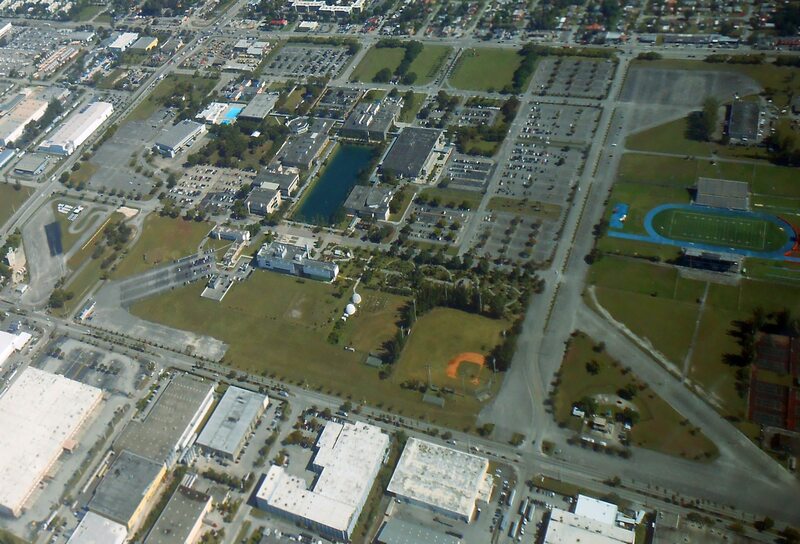 A 2004-2005 aerial view of Opa-Locka West Airport as seen from a Robinson helicopter. Opa-locka West Airport was reportedly damaged by Hurricane Wilma in October 2005. 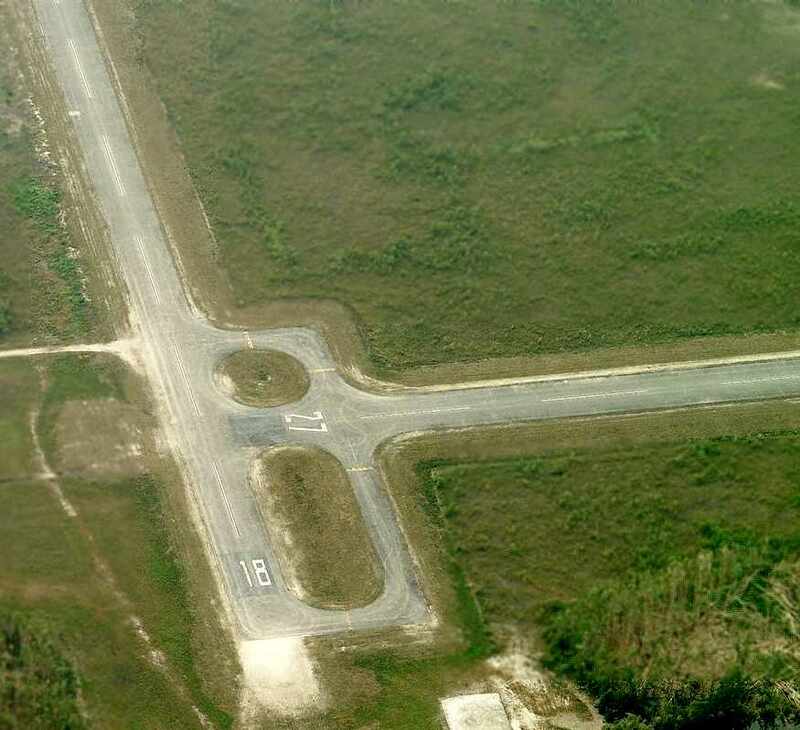 A circa 2006 aerial photo looking south along Opa-Locka West Airport's former Runway 18.
with the traffic pattern circle on the north side, and a small ramp on the south side. the pictures from 2006 did not show any apparent damage. 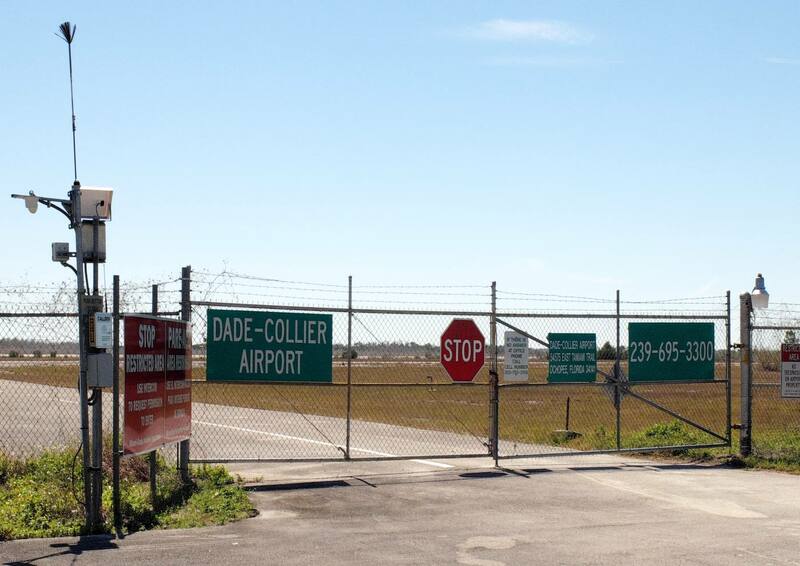 Miami-Dade County announced in June 2006 that the airport would be decommissioned. The real reason for the county's closure of the airport soon became apparent – greed. with an estimated yield of 47 million cubic feet of limestone worth between $500 million - $1.2 billion. opened at the former airport site in January 2007.
with the former Runway 18/36 having been reused as a drag strip. Note how much bigger the quarry (filled with water) had become, compared to its depiction on the 1988 topo map. A 3/4/18 aerial view by Alex Price looking southeast at Opa-Locka West Airport. What a shame to see this nice general aviation infrastructure just wasting away. 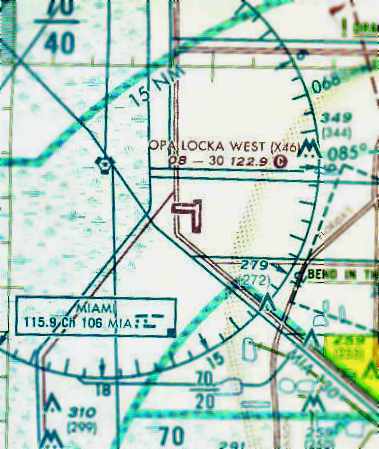 The site of Opa-Locka West Airport is located east of the intersection of West Okeechobee Road & North Krome Avenue. Sunnyside Airport, as depicted as a commercial airport on the April 1937 Miami Sectional Chart (courtesy of Chris Kennedy). in what eventually became the center of Miami. as it was not yet depicted on the December 1935 Miami Sectional Chart (courtesy of Chris Kennedy). 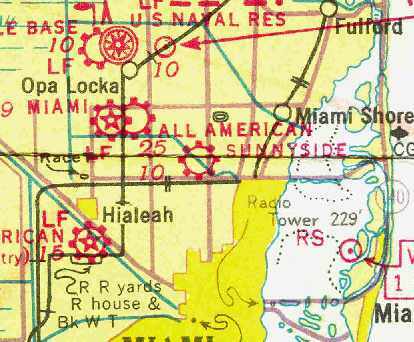 The earliest depiction which has been located of Sunnyside Airport was on the April 1937 Miami Sectional Chart (courtesy of Chris Kennedy). It depicted Sunnyside as a commercial airport. as that is how it was listed in The Airport Directory Company's 1937 Airport Directory (courtesy of Bob Rambo). It described Sunny South as a commercial airport having a single 2,640' east/west sod runway. with possibly a single hangar & some other small buildings on the east side of the field. depicted Sunny South as a commercial airport. or the 1946 Miami Local Aeronautical Chart (according to Brian Rehwinkel). According to Robert Uricho's obituary (courtesy of Michael McMurtrey), following his Army discharge after WW2, Robert purchased Sunny South Airport. showed the field to be quite well-used. Like many other general aviation fields, it served many returning veterans during this port-war aviation boom. with a single hangar at the east side of the field. showing the hangar & a total of 37 light general aviation aircraft. Steve McDonald recalled, “Sunny South on 7th Avenue about 95th Street was run by Charlie Darnes. Ruth Mullis recalled, “I had around 25-30 miles to go to work [at Brown's Airport]. I lived in Dade County (northwest area); the back fence at my home was the north extension of Sunny South Airport. Sometimes I would work later than my regular hours & Al would tell me to take a plane home instead of facing all the work traffic driving. Sounded good to me; I could make it home in 10 minutes & tie down right next to my backyard. 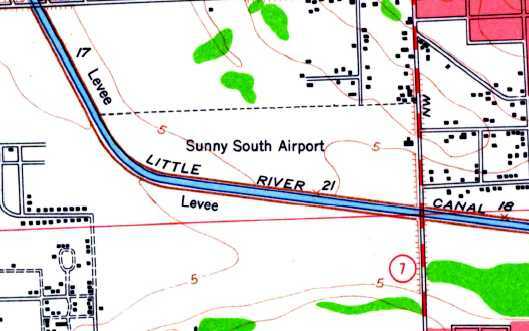 The 1950 USGS topo map depicted Sunny South as an open area on the north side of the Little River, with a single T-hangar on the east side. 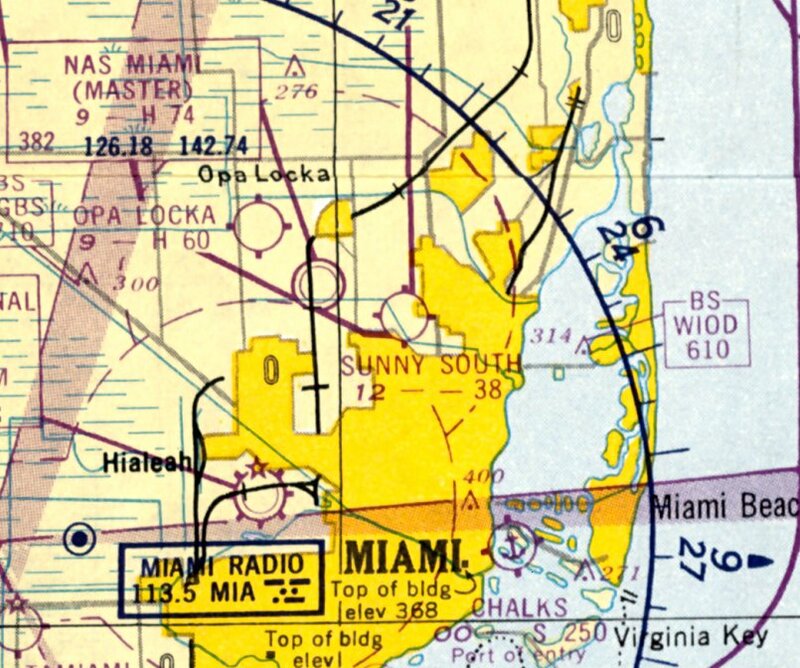 The last aeronautical chart depiction which has been located of Sunny South Airport was on the July 1950 Miami Sectional Chart. It depicted Sunny South Airport as having a 3,800' unpaved runway. 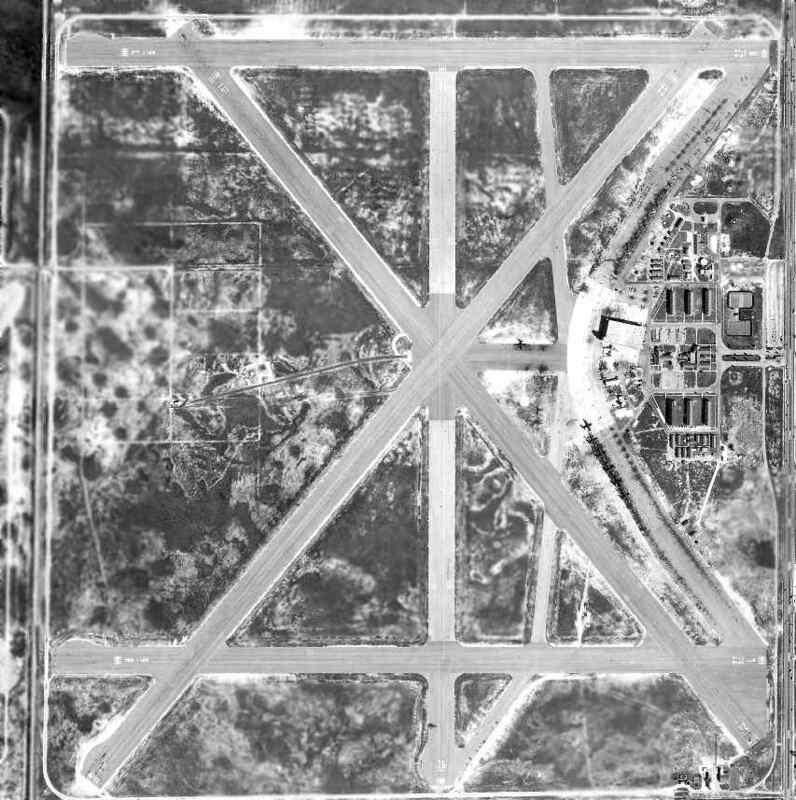 A 5/7/51 FL DOT aerial photo of Sunny South Airport (courtesy of Brian Rehwinkel). 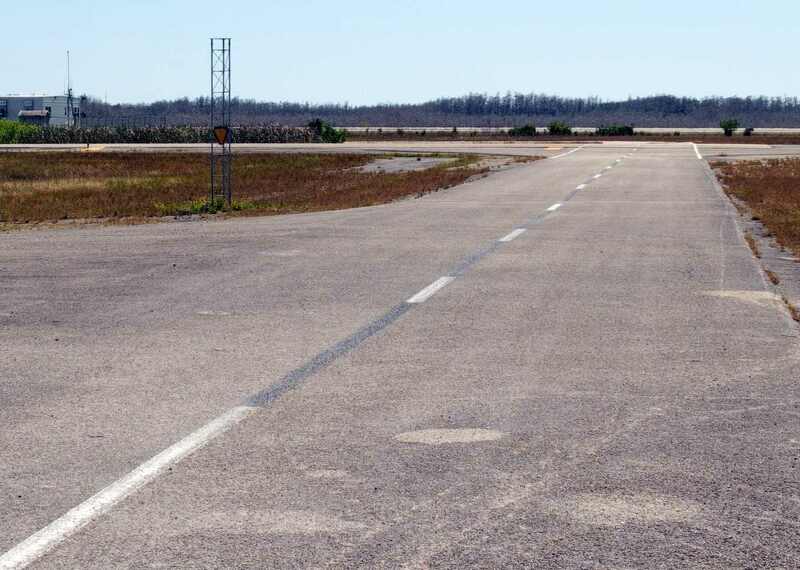 with a paved taxiway having been added, running to a paved takeoff strip which had been added over the western third of the grass runway. Strangely, it appears as if the hangar seen in the 1946 photo had been removed at some point. Note also the "Sunny South Airport" lettering in between the runway & the canal bordering the south side of the field. 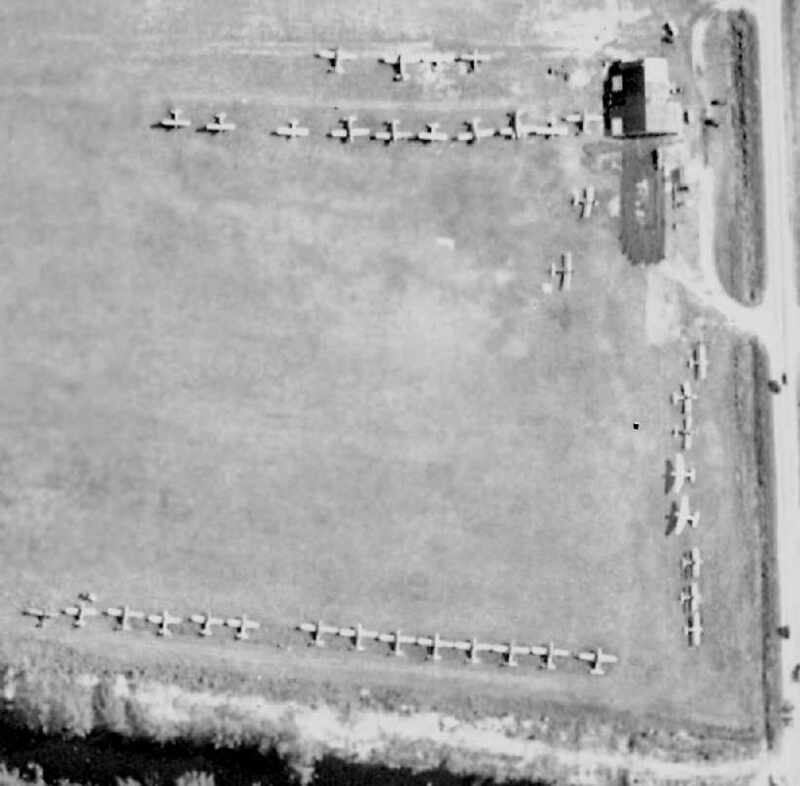 showing a total of 32 light general aviation aircraft parked at the field, along with a few small buildings. which described Sunny South as having a 3,800' unpaved runway. as it was no longer depicted at all on the January 1953 Miami Sectional Chart. It presumably succumbed to the explosive post-war urban growth in the Miami metropolitan area. A 1980 aerial view showed housing covering the site, with no trace left of the airport. A 2014 aerial view showed the site of Sunny South Airport consists of residential housing & some commercial development. The North Shore Medical Center is located adjacent to the north side of the airport site. Not a trace appears to remain of the former airport. The site of Sunny South Airport is located at the southwest corner of Northwest 7th Avenue & 91st Street. 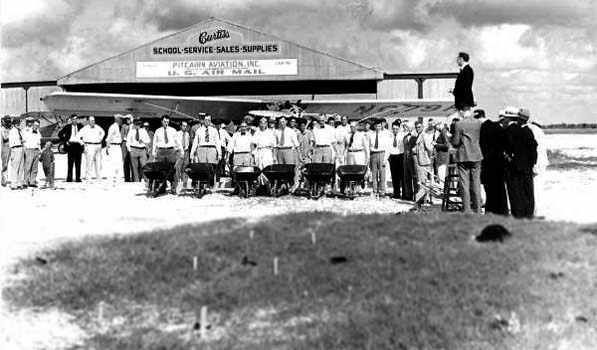 An 11/4/29 photo of a groundbreaking ceremony at the Miami Municipal Airport's Curtiss Flying Service / Pitcairn Aviation hangar (FL State Archives photo). which sat adjacent to Miami Municipal to the east. The fields were separated by a set of railroad tracks. 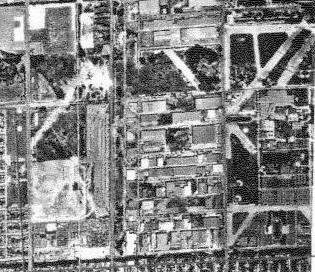 Both fields were located a mere 2 miles to the southeast of present-day Opa-Locka Airport. and the city created an Aviation Department to administer it (according to Antolin Carbonell). According to Joe Benson, Miami Municipal Airport was used by Eastern & one or two other airlines early on. Once Pan Am Field opened (in 1928), Municipal Airport was then left to general aviation. of a groundbreaking ceremony at the Curtiss Flying Service / Pitcairn Aviation hangar. This groundbreaking presumably was for a 2nd hangar. 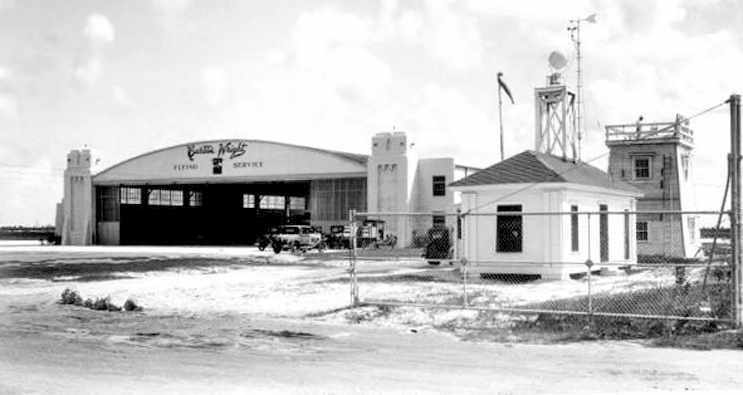 A 1930 photo of the Curtiss-Wright Corporation hangar at Miami Municipal Airport (Florida State Archives photo). According to the state archives, this hangar was utilized by Pitcairn Aviation (the predecessor to Eastern Air Lines), and by Eastern Air Lines. The small building on the right was the U. S. Weather Bureau Weather Station. 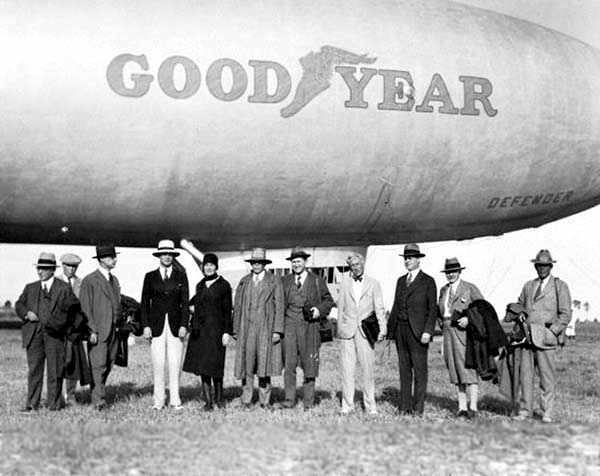 A 2/11/30 photo of the Goodyear Blimp “Defender” at Miami Municipal Airport (Florida State Archives photo). Before he died in 1930, Glenn Curtiss donated additional acreage to this field (according to Antolin Carbonell). Note the large number of planes scattered around the hangar at the bottom of the photo. one of which had "Miami" painted on the roof. The manager was listed as the Department of Aviation. 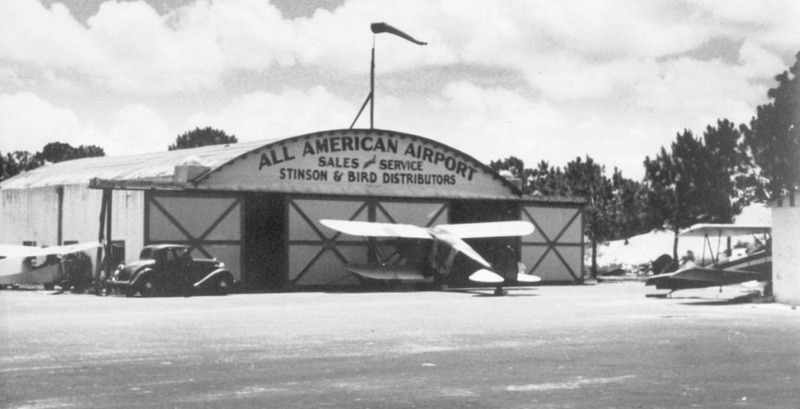 held January 5-7 at Miami Municipal Airport (Florida State Archives photo). described Miami Municipal Airport as having 2 2,300' sandy runways, oriented northeast/southwest & northwest/southeast. The hangars were said to have "Miami" painted on the roof. and by the mid 1930's it had several hangars (according to Antolin Carbonell). One of the hangars built in the Pueblo style burned down in the 1930's. on the December 1935 Miami Sectional Chart (courtesy of Chris Kennedy). Amelia Earhart took off from Miami Municipal Airport on her ill-fated 1937 final flight (according to Antolin Carbonell). with the longest being the 3,500' northwest/southeast runway. 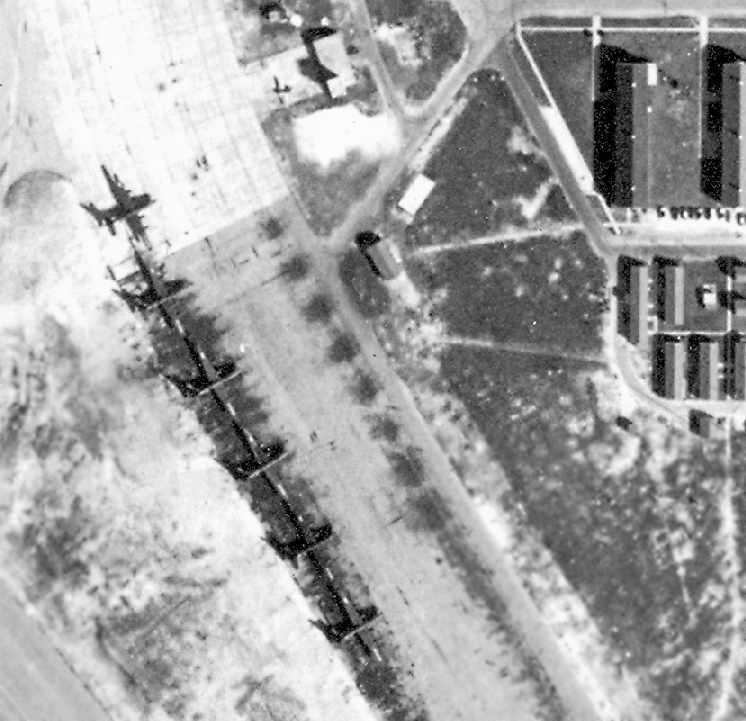 The aerial photo in the directory depicted a single hangar on the west side of the field. and the May 1941 Miami Sectional Chart (courtesy of Chris Kennedy). and 3 aircraft along the southeast side of the field. Miami Municipal was purchased in 1942 by the Navy from the City of Miami. 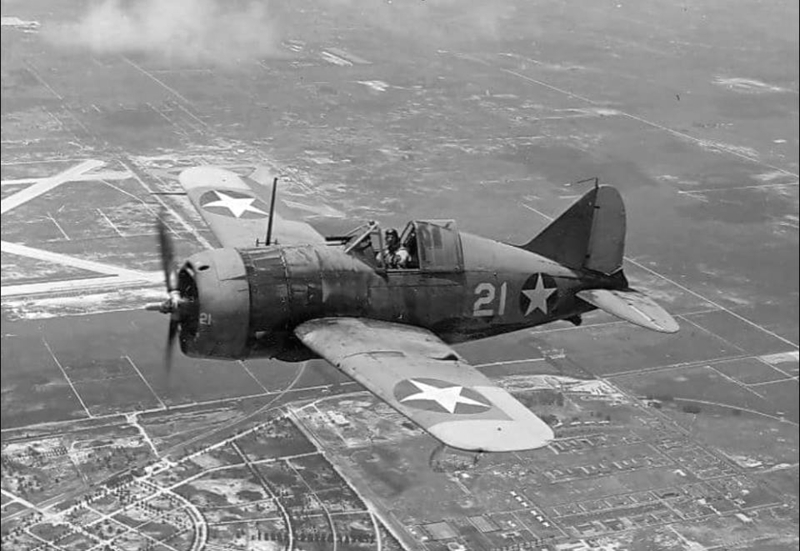 which conducted training in SBD Dauntlesses, TBF Avengers & PB-4Y Privateers. Miami Municipal & Master Field were connected by a taxiway running over the railroad tracks. 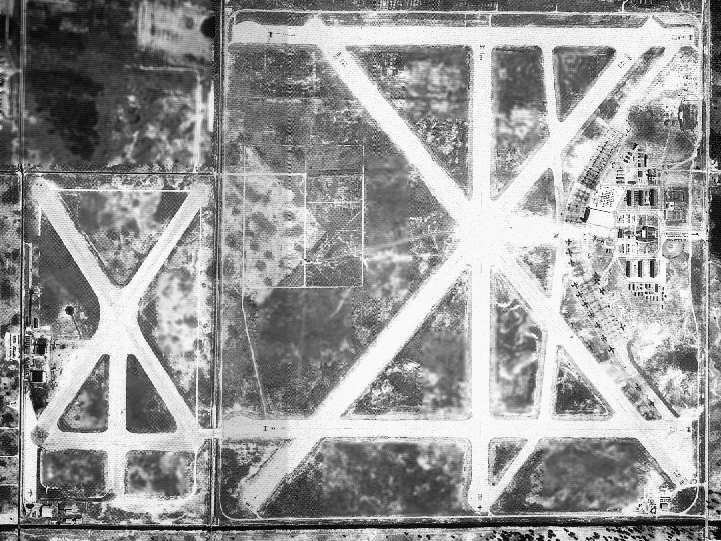 A WW2-era National Archives aerial view of Miami Municipal Airport (west) & Master Field (east). 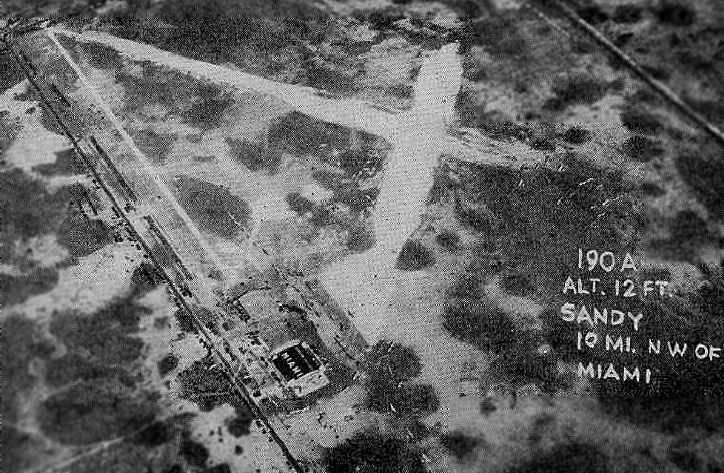 During its period of Navy use, Miami Municipal Airport was also known as South Field #2 & Navy Municipal Field. According to Benson, Miami Municipal was controlled from the tower at Master as an NOLF/MCOLF. Master Tower controlled the gates for taxiing aircraft that had to cross the railroad between the 2 fields. During World War II the Navy used the field for its personnel transport operations. 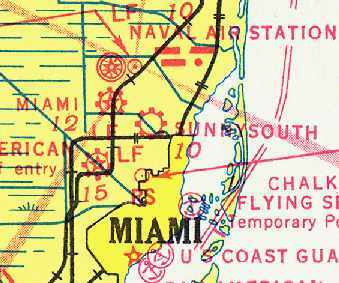 "Miami" was depicted as a military airfield on the 1943 Miami Sectional Chart (courtesy of Chris Kennedy). The 1944 US Army/Navy Directory of Airfields (courtesy of Ken Mercer). described "Miami, Navy" airfield as having a 3,600' hard-surfaced runway. The remarks included, "Restricted to training operations & scheduled Naval transports. Serviced by International Airport Tower." and a few small buildings west of the runways. 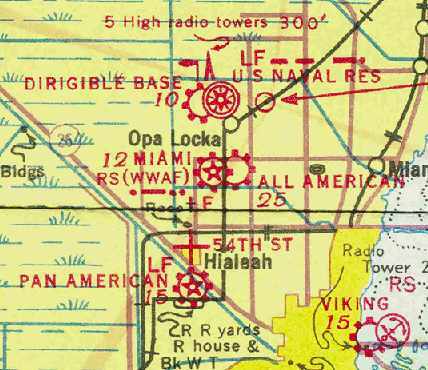 "Miami (Navy)" was depicted as a military airfield on the July 1944 Miami Sectional Chart (courtesy of Ron Plante). (her tragic final flight launched from Miami Municipal, thus the name). and stacking them & securing them with cement. It was about 4' high I'd guess & they mounted the plaque on it's face. A 1948 aerial view looking east-northeast at Amelia Earhart Field, with the larger Master Field in the background (Florida State Archives photo). Several aircraft were visible on the Amelia Earhart ramp at the bottom of the photo. 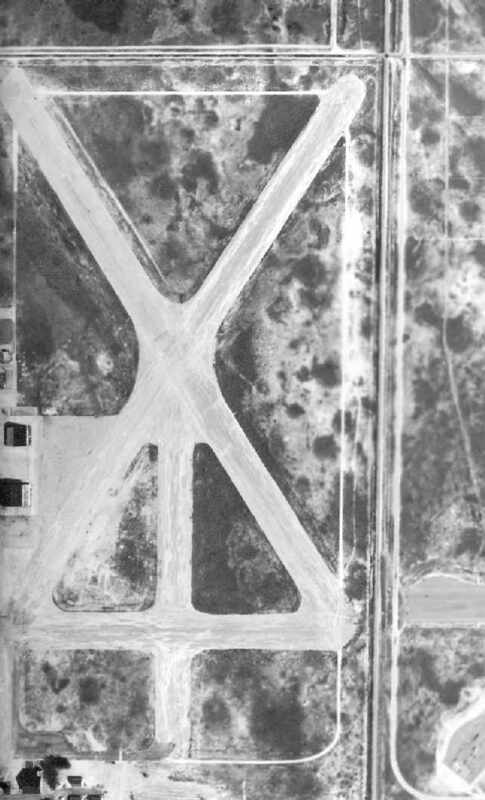 The taxiway over the Seaboard Air Line Railroad tracks connecting the 2 airports was still visible (but was eliminated later). The 1949 USGS topo map depicted “Municipal Field” as having 2 paved runways, along with taxiways, and a ramp & beacon on the west side. It also depicted the adjacent “Master Field”. Joe Benson noted, "Municipal never saw another aircraft after Master closed [in 1954], that I've ever heard of. I went to several drag racing events at the field during the 1950s." 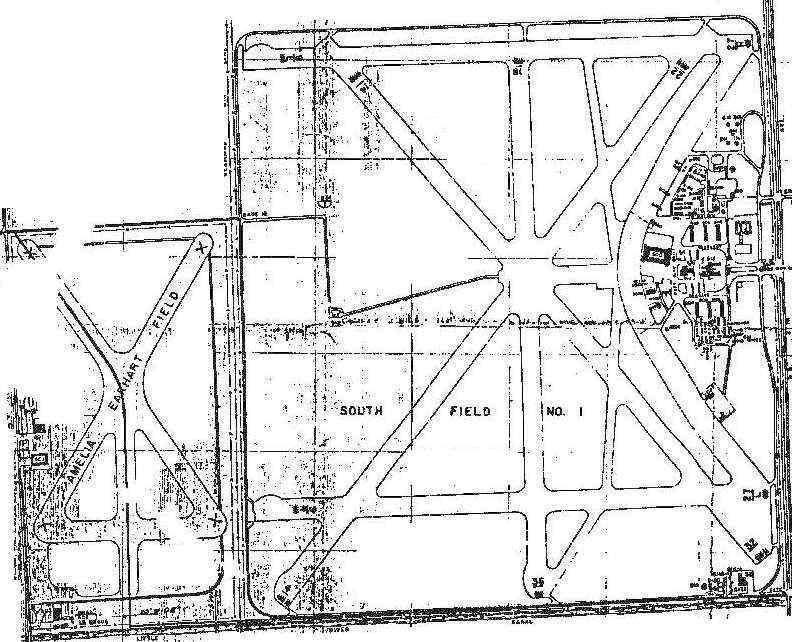 and Master Airport (labeled "South Field #1"). 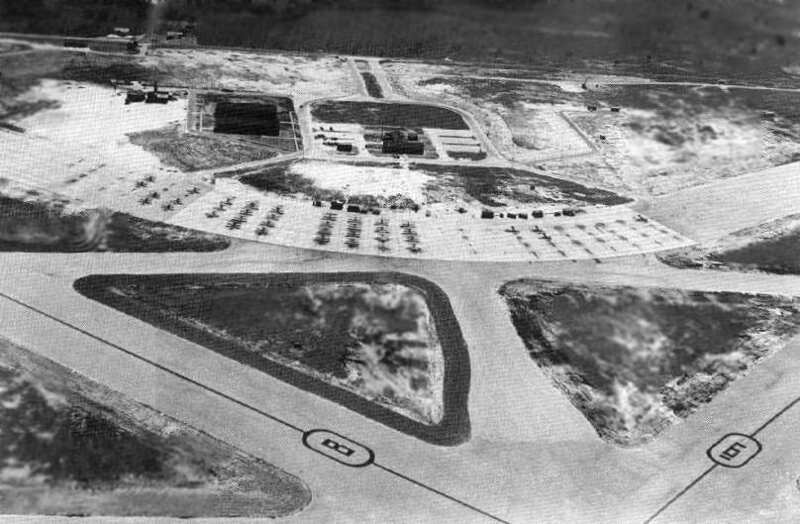 Miami Municipal Airport, as depicted on a 2/27/56 US Government aerial photo (courtesy of the FL DOT). as there were no aircraft visible on the field, or any other indications of current usage. The field remained completely intact, though, with all 4 runways & 2 hangars still remaining in good condition. 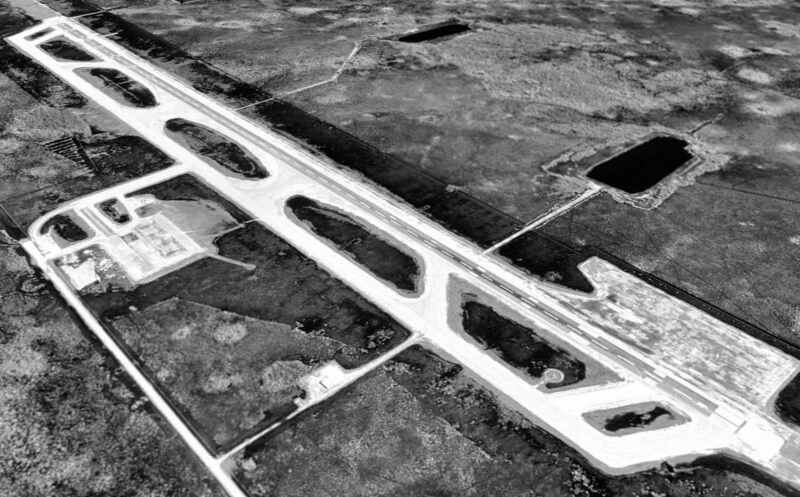 Miami Municipal Airport was labeled “Closed” on on a 1956 Approach Plate (courtesy of Tom Beamer). A 1959 advertisement for drag races at Amelia Earhart Field. of The Cabriolets car club, including Ernie Schorb & Harry Steele. as well as the adjacent Master Airport - labeled simply “Airport (Abandoned)". 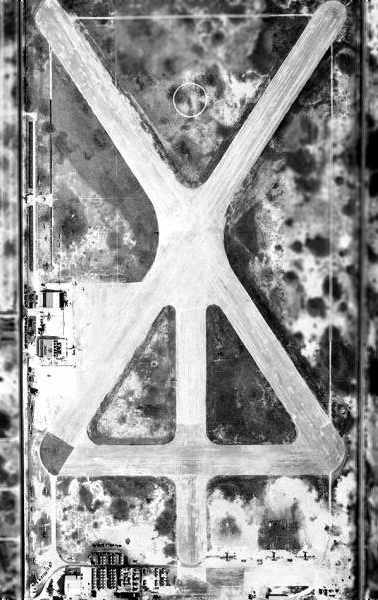 Miami Municipal Airport was used to stage war supplies during the 1962 Missile Crisis (according to Antolin Carbonell). it was gone & the marker/pillar that it was mounted on was knocked down & just a pile of rocks." but the project fell through. tore up all the runways & built an Intermodal freight yard in there." 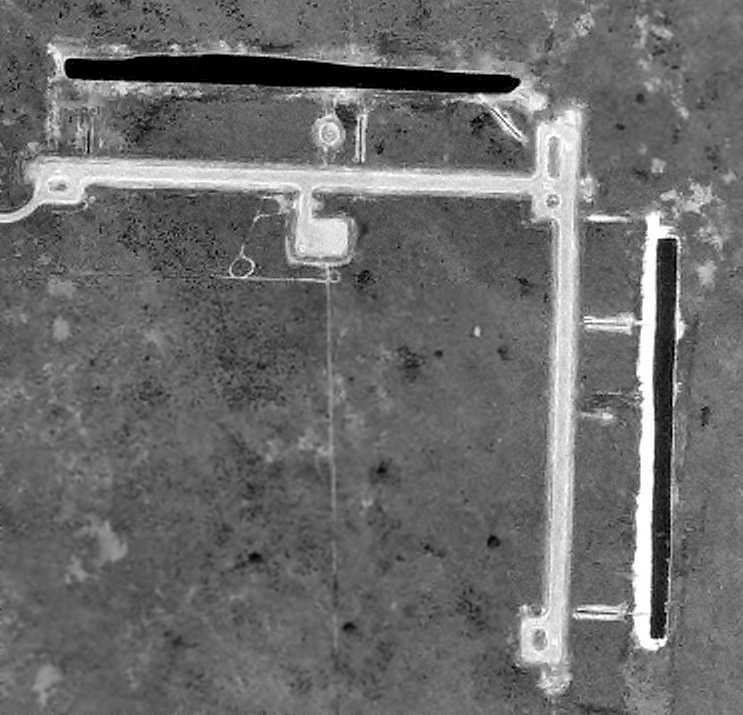 Portions of Miami Municipal Airport's northwest/southeast runway were still recognizable in a 1994 USGS aerial photo. with only the faintest trace of the northwest/southeast runway still recognizable. 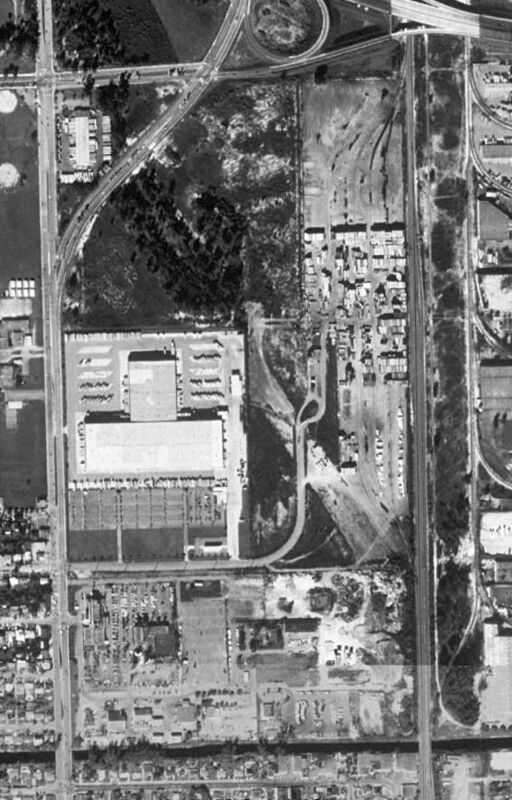 The site of Miami Municipal Airport is located northeast of the present-day intersection of East 8th Avenue & East 49th Street. 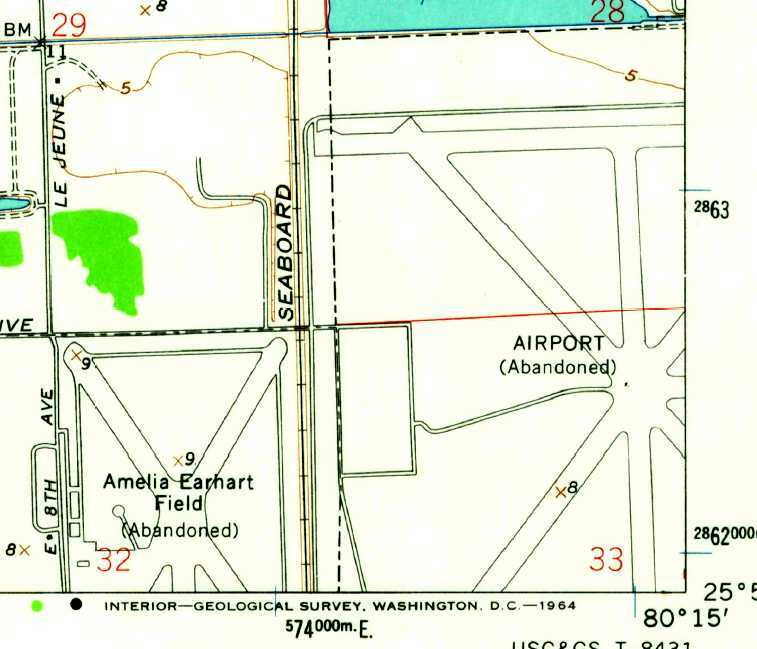 A park named Amelia Earhart Park has been built to the northwest, but does not include the site of the former airfield. and an Army Corps of Engineers report. All American Field, as depicted on an 8/26/31 aerial view. which sat adjacent to Master Field to the west. This field was originally known as All-American Airport. All American Field was the site of the All American Air Meets as early as 1931 (according to Antolin Carbonell). The earliest depiction of All American Field which has been located was on an 8/26/31 aerial view. 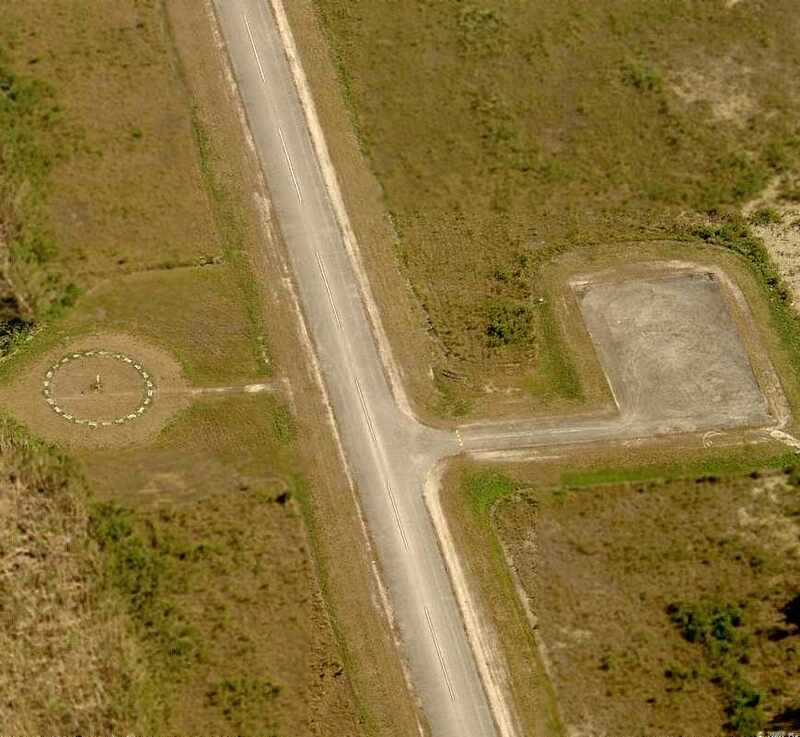 It depicted a rectangular grass field, with an airport circle marking on one side. The surrounding countryside was strikingly undeveloped. 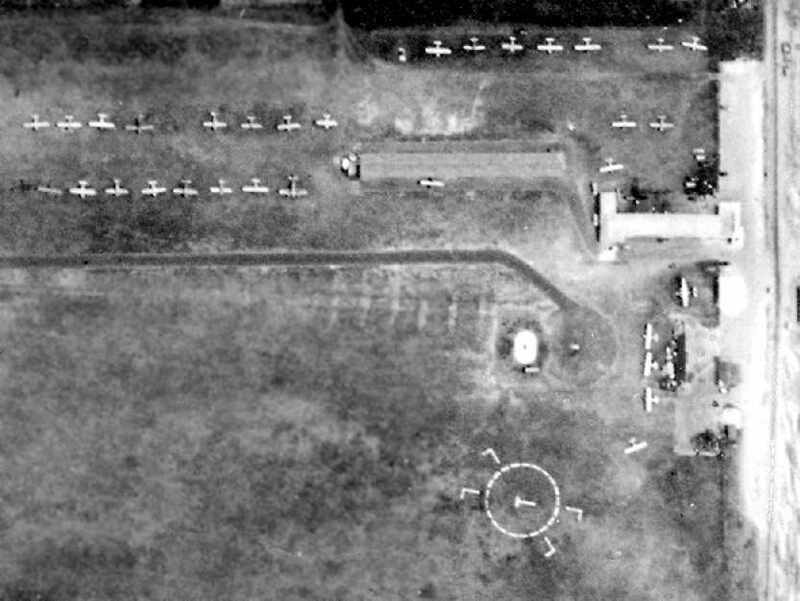 A closeup of All American Field from the 8/26/31 aerial view, showing 2 biplanes next to a small building on one corner of the airfield. with the north/south runway also having a 1,500' hard-surface portion. The hangar was said to have "All-American Airport" painted on the roof. was on the December 1935 Miami Sectional Chart (courtesy of Chris Kennedy). 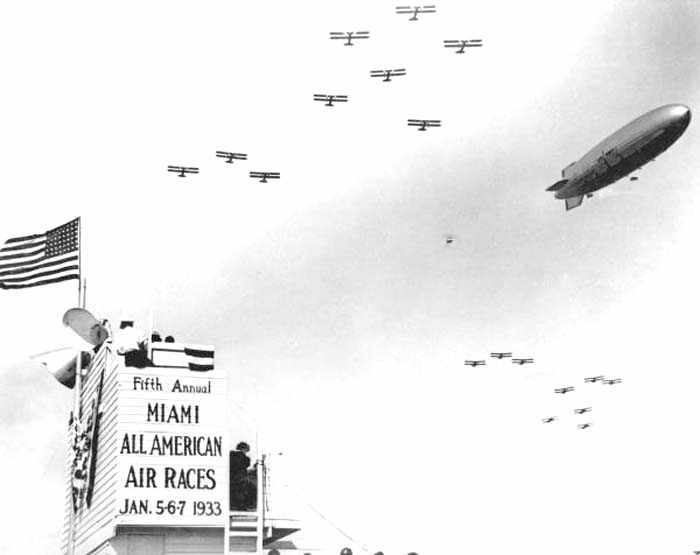 It depicted All American Field directly adjacent to Miami Municipal Airport. An undated aerial view of All-American Airport from the Airport Directory Company's 1937 Airports Directory (courtesy of Bob Rambo). The directory described All-American Airport as having a single 1,800' shell runway, oriented northwest/southeast. The aerial photo in the directory depicted a single hangar on the field, which had "All-American Airport" painted on the roof. An undated (circa 1930s?) photo of several planes in front of a hangar marked “All American Airport” (courtesy of Tom Heitzman). 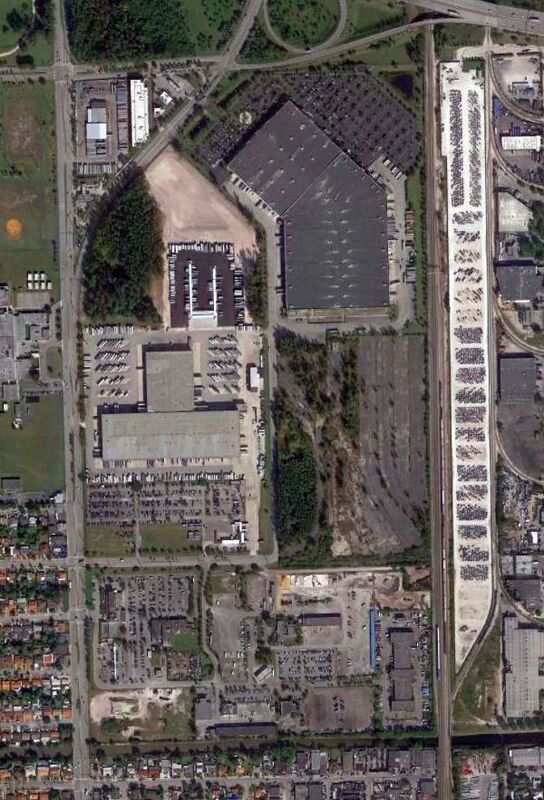 The photo depicts hills behind the hangar – is this really of the All American Airport in Miami? on the April 1937 Miami Sectional Chart (courtesy of Chris Kennedy). and built the 1st Miami International Airport, with 7 runways & one hangar (according to Antolin Carbonell). Robert Law Weed designed a terminal, which never was built. which confirmed that the name of the airport at that time was "Miami International (Master) Airport". 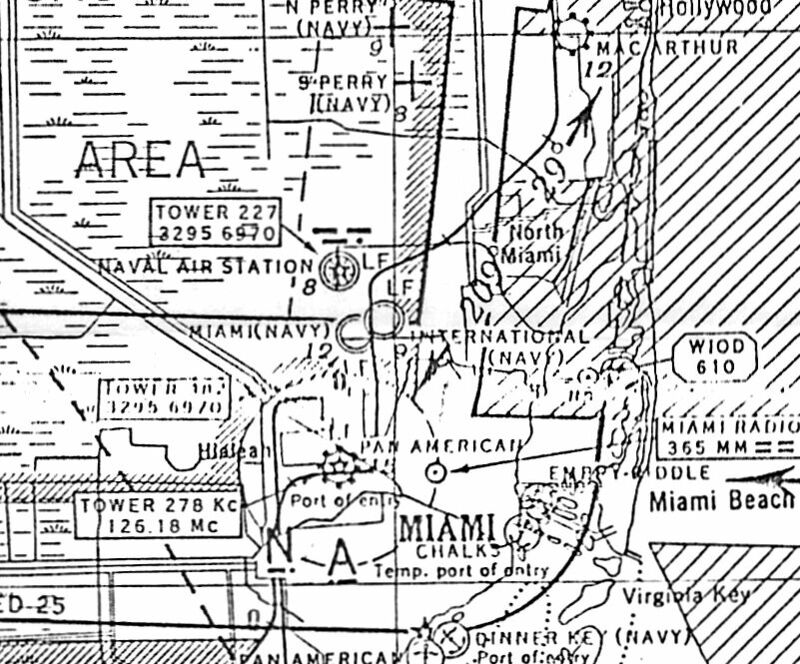 as it was no longer depicted at all on the May 1941 Miami Sectional Chart (courtesy of Chris Kennedy). 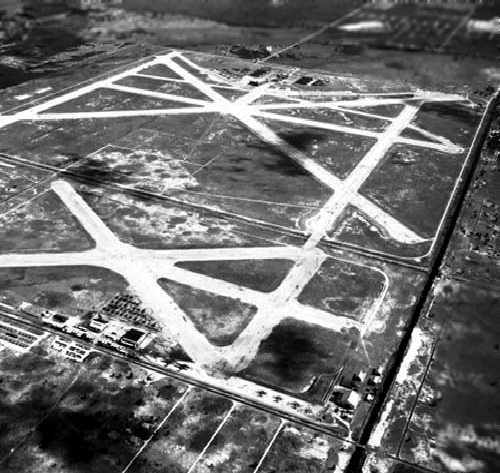 In 1942 the Navy bought the Airport & added it to the Naval Air Station Miami complex (according to Antolin Carbonell). Around that time the airport became known as Master's Field. The Navy built several barracks & a mess hall. 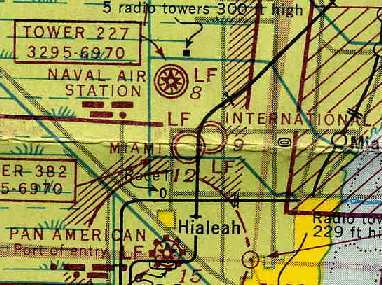 "International" Airport was depicted as a military airfield on the 1943 Miami Sectional Chart (courtesy of Chris Kennedy). 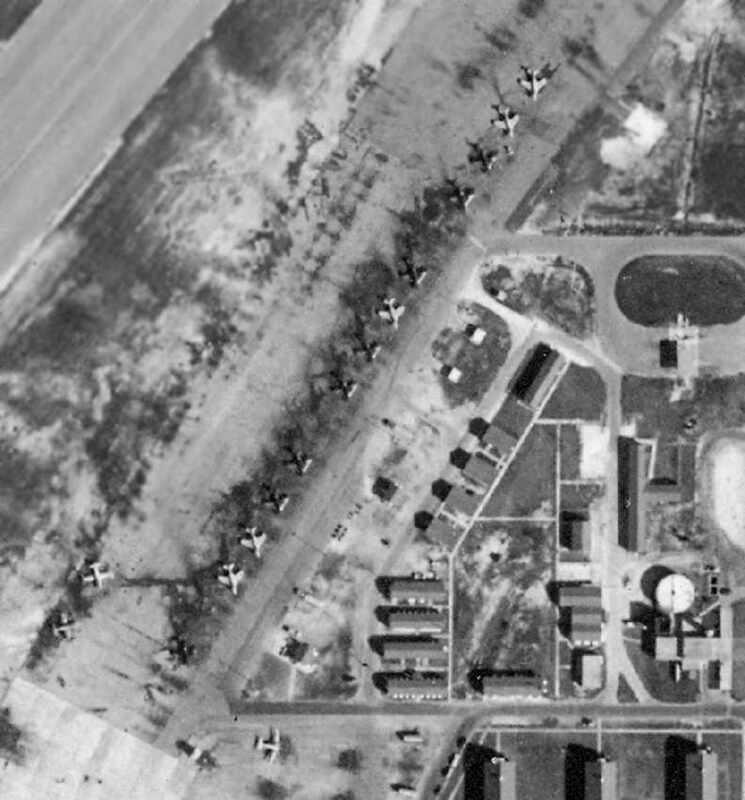 A 1943 aerial view looking east at dozens of aircraft on the Master Field ramp (National Archives photo). with Master Field ahead of the plane's nose & Miami Municipal Airport barely visible under the far wing. described "International (Master), Navy" as having a 7,400' hard-surfaced runway. The remarks included, "Restricted to training operations & scheduled Naval transports." and a large curved ramp area in front of a complex of buildings to the east of the runways. 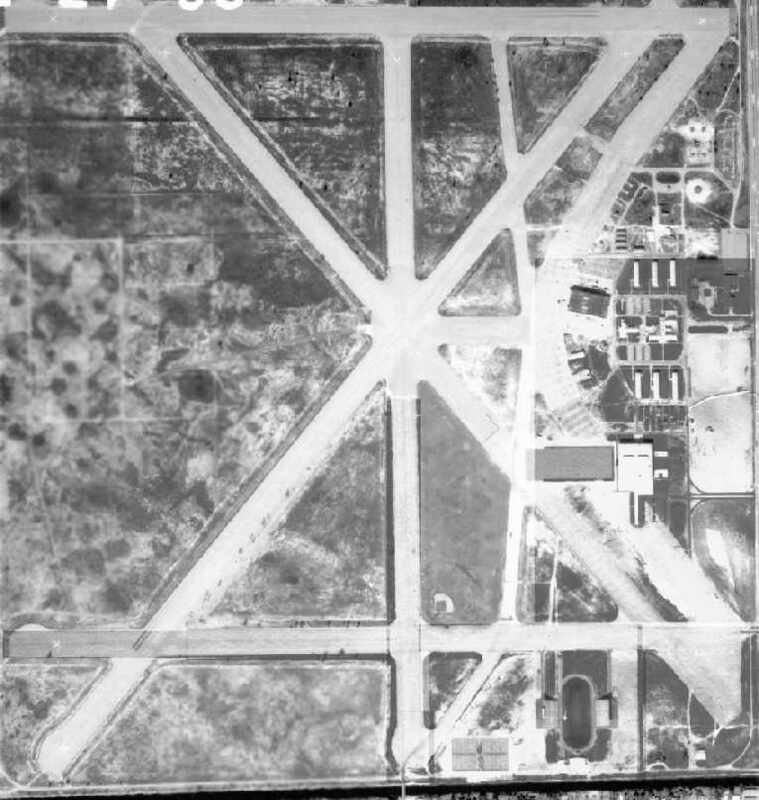 During its period of Navy use, Master Airport was also known as South Field, South Field #1, and Navy Master Field. Richard Snedeker recalled, “In early 1946 I was assigned to Master Field after completing training as an Aviation Machinists Mate. In Miami, I joined a squadron designated ASDEVRON, for Anti-Submarine DEVelopment squadRON. Our mission was to develop new techniques for anti-submarine warfare using existing aircraft then in the Navy's inventory. including F4U's, F6F's, TBM's, SB2C's, PBY's, SNJ's, etc. We even had an F7F Tigercat. the use of surplus wing-mounted fuel tanks as airborne napalm bombs. We had to develop a satisfactory set of easily fabricated tail fins that would stabilize the tanks during a dive-bomb type delivery. 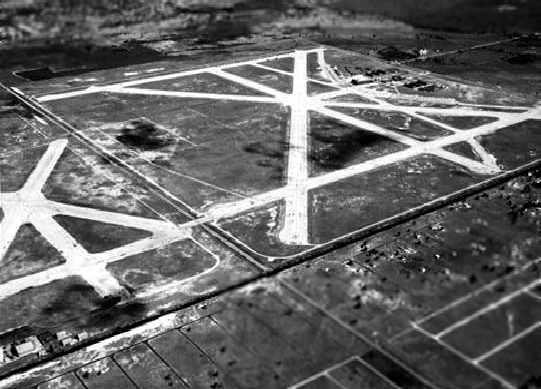 A 1948 aerial view looking northeast at Master Field, with the smaller Amelia Earhart Field also visible on the left (Florida State Archives photo). 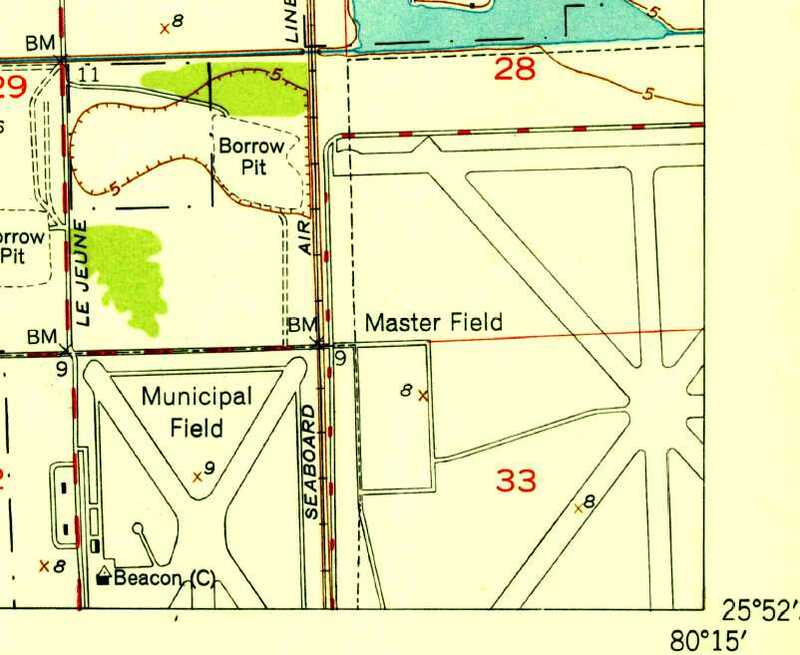 The 1949 USGS topo map depicted “Municipal Field” as having 4 paved runways. It also depicted the adjacent “Municipal Field”. A still from the 1949 movie “Slattery's Hurricane” showing Master Field' control tower & attached hangar (courtesy of Harper Poling). when they were flying the PB4Y-2 Privateers for hurricane hunting. 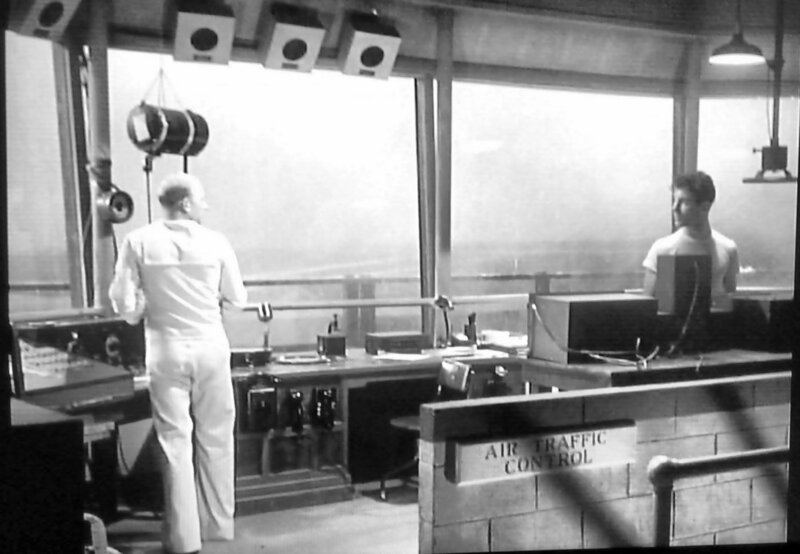 A still from the 1949 movie “Slattery's Hurricane” showing the interior of Master Field' control tower (courtesy of Harper Poling). which continued to operate aircraft from Master Field for several more years. A 1950s photo of Harper Poling on a mighty Grumman F8F Bearcat at Master Field. 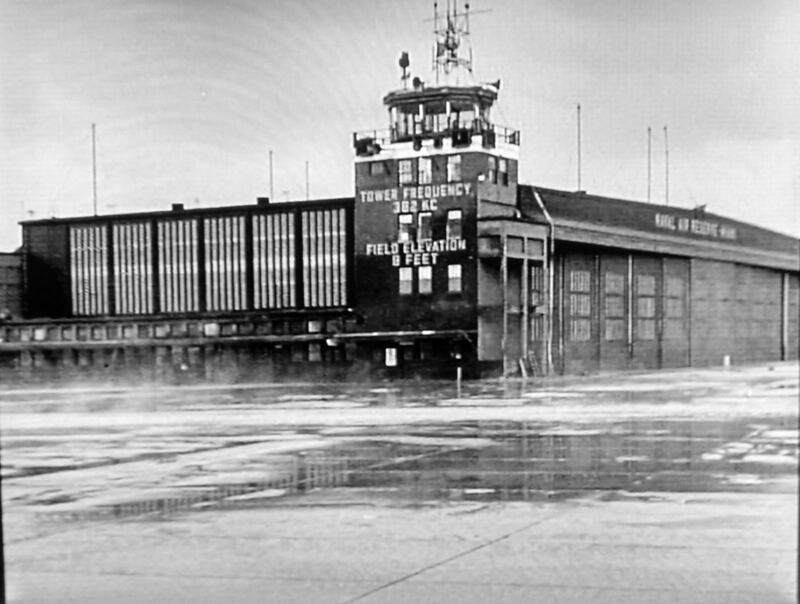 A 1950s photo by Harper Poling of Master Field's control tower & attached hangar. 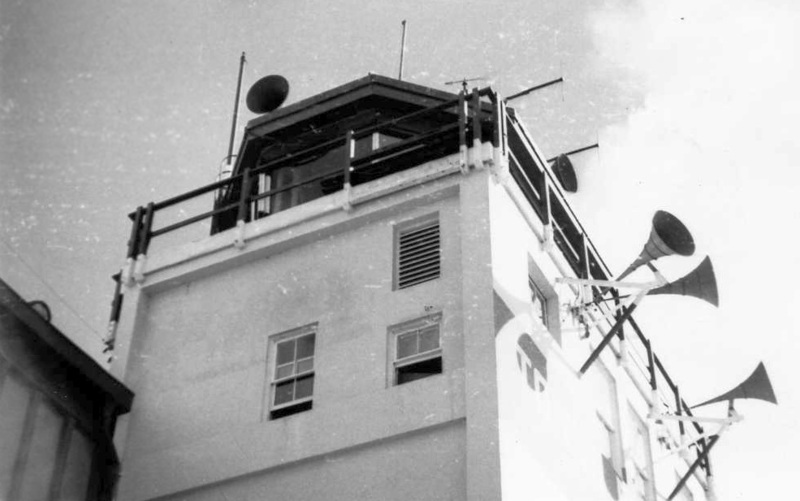 A 1950s photo by Harper Poling of Master Field's control tower. as depicted on a 1956 Approach Plate (courtesy of Tom Beamer). 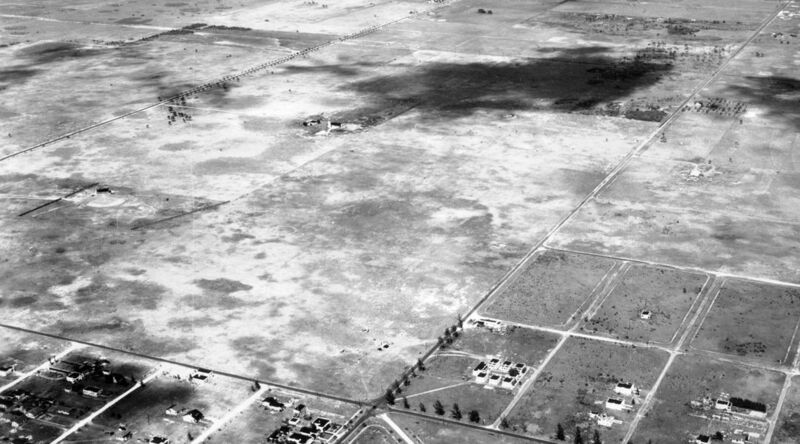 Master Field, as depicted on a 2/27/56 US Government aerial photo (courtesy of the FL DOT). with a total of over 24 fighters & patrol aircraft on the ramp. showing a large number of Grumman F9F Cougar jet fighters & several other jet & propeller aircraft. showing a total of 6 Consolidated PB4Y-2 Privateer patrol bombers. "one of which John Glenn flew his F8U at in 1957." A 1958 map of a “Masters Field Course” for a road race to be held on the runways. Automobile races were held on the Master Field runways in 1958 & 1959. Master Field was closed by the Navy in 1959, according to Brian Rehwinkel. as well as the adjacent "Amelia Earhart Field (Abandoned)”. for staging military supplies & equipment during the Cuban Missile Crisis. That was presumably the last military use of the facility. A March 1962 photo of a Former NAS Miami Master's Field hangar (Florida State Archives photo). This building later became the Pen Playhouse at the Dade County Junior College. 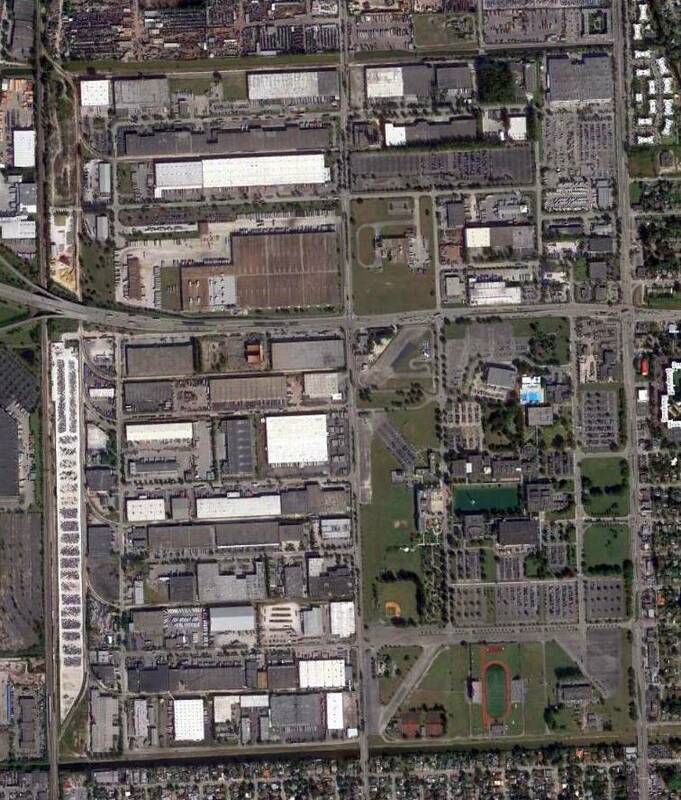 and became the Miami-Dade Community College North Campus (according to Antolin Carbonell). A hangar was later converted into a gymnasium. 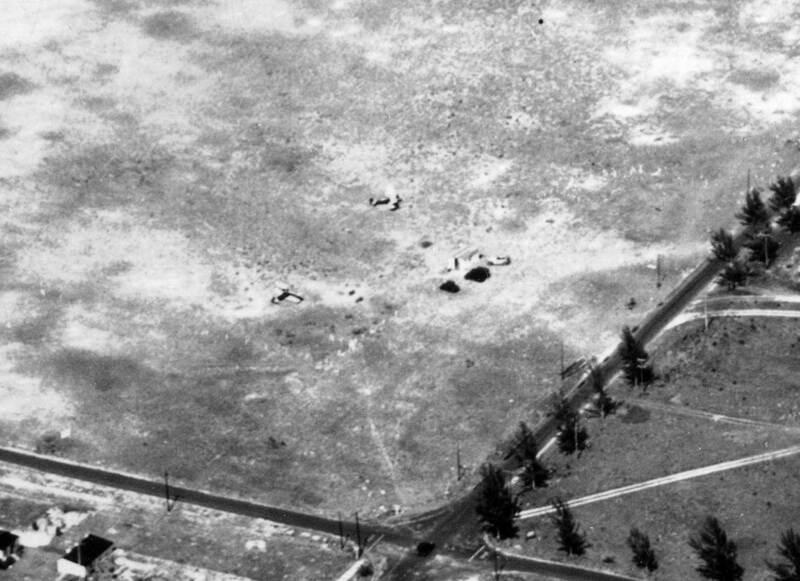 Master Field, as depicted on a 12/27/63 US Government aerial photo (courtesy of the FL DOT). with at least one building & parking lot having already been built over the former ramp on the east side of the field. Master Field, as depicted on a 12/28/70 US Government aerial photo (courtesy of the FL DOT). although most of the length of most of the runways were still largely intact. but later expanded rapidly & you can hardly see anything anymore." 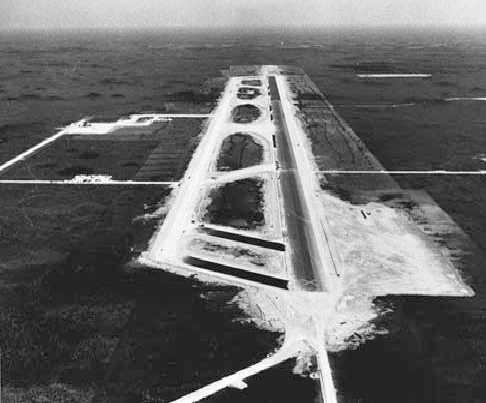 The remains of Miami Municipal Airport & Master Airport in 1986.
but recognizable portions of at least 5 asphalt runways still remain on the eastern half of the airfield site. still survives at the southeast corner of the Miami-Dade College Campus. It is used for Maintenance shops. The building was recently refurbished but bears little resemblance to its original use. on the east side of the former Master Airport (just east of the intersection of Lake Road & Kennedy Drive). 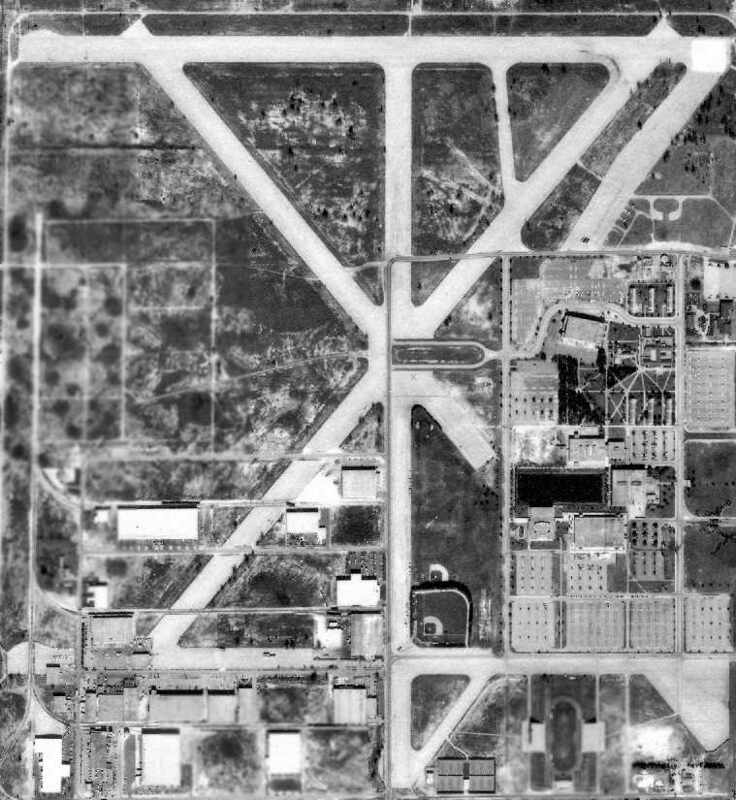 A 2014 aerial photo of the site of Master Airport showed the remains of 5 runways remain recognizable. A 12/17/18 aerial view by Alex Price looking northeast at the site of Master Airport, showing the remains of several runways. Alex remarked, “Even to a superficial observer, the runways are still intact enough to suggest an airfield was here. 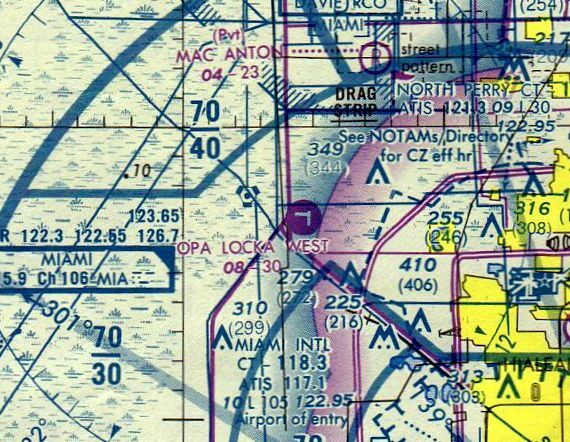 I wonder what air traffic control was like in the days when Opa-Locka was two airports crowded together with Master Field, Amelia Earhart Field, and Miami Army Airfield (now KMIA). The site of Master Airport is located west of the present-day intersection of Unity Blvd & Gratigny Parkway. 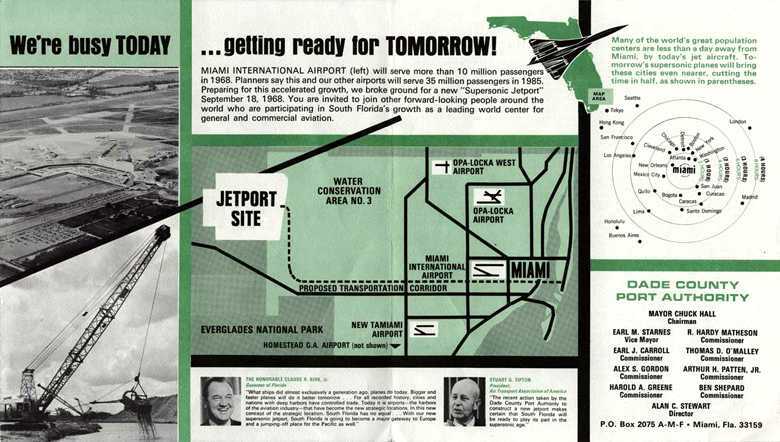 touting the 9/18/68 groundbreaking for the new Miami “Supersonic Jetport”. This huge, nearly abandoned modern airport is a true "white elephant". to mitigate the noise impact of SST operations. the never-built US SST (in this case, a Boeing 2707, in Pan Am markings). was originally planned to be the largest airport in the world, with 6 runways. It was built from scratch in the middle of the Everglades. nor on the March 1966 Miami Sectional Chart (courtesy of Ron Kunse). ground was broken on 9/18/68 for the new Miami “Supersonic Jetport”. or when the court case brought by the environmentalists was finally decided, but we were landing on it in 1967! We used to fly out to what we called the 'Miami Jetport' & shoot 'dead stick' landings in our little Cessna 150s. I never knew it was supposed to be for the American SST. From what I recall, the runway & taxiways were literally brand new, but I don't remember seeing any buildings out there. When we started using that field, it was totally deserted. No one or no other airplanes (besides ours) were anywhere around. This was before the airlines decided to use the Jetport to shoot 'Touch & Goes' for crew training. and then pull our power (except for blasts of power every minute or so to keep carburetor Ice from forming) & then glide in the general direction of the Jetport. as we would lose approximately 500' with each turn to come out in the 'Key Position' at the end of the downwind leg at approximately 800' AGL. After that, it was a normal Power Off landing for us. Of course, the trick was to keep going further & further away from the airport & then make it back to land. which depicted the field as having a single paved east/west runway with a parallel taxiway. the US SST was canceled, eliminating the airport's reason for being. would bring unacceptable harm to the Everglades. the decision was made to cancel the new airport, and construction ceased in 1970.
so it was allowed to remain as it was built, strangely all alone. An undated (circa 1970s?) 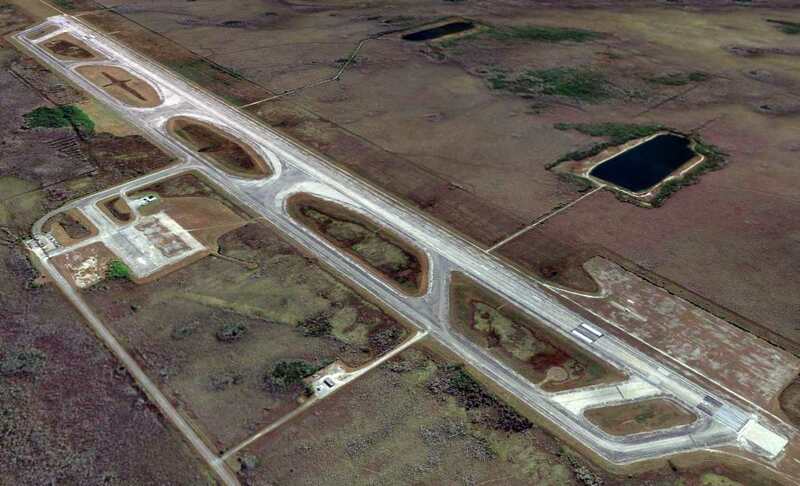 aerial view looking east over the newly-constructed single runway of the Everglades Jetport. with its only purpose being to support infrequent civil flight training by heavy airliners. Its single concrete Runway 9/27 measured a whopping 10,500' in length. airline crews had to be trained with flights in actual aircraft. as it did not have any other kind of traffic. Plus, two major airlines were headquartered nearby at Miami International: Eastern Airlines & Pan Am. was on the January 1970 Miami Sectional Chart (courtesy of Chris Kennedy). 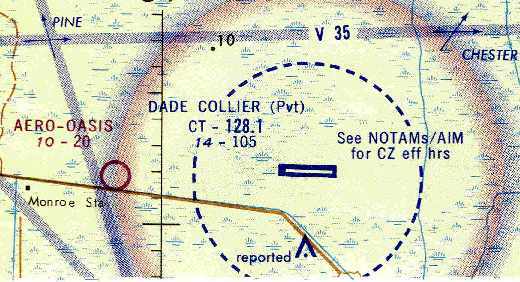 It depicted Dade Collier as a private airfield having a single 10,500' paved runway & a control tower. 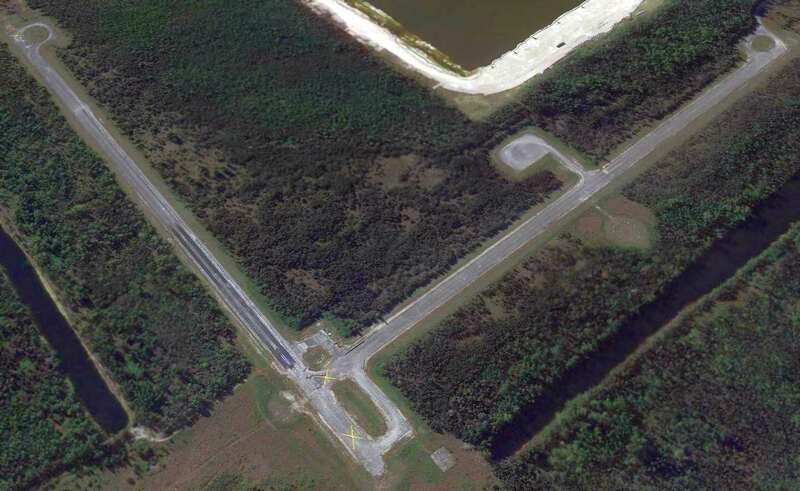 as having a single paved runway, paved parallel taxiway, and a paved ramp with a tower. flying ILS approaches around the clock. A Douglas DC-9-14 (N8910E cn 45771/58) was destroyed in a non-fatal crew training accident at Dade-Collier Airport on 2/9/79. According to Mike Vidal, “The DC9-14 that crashed belonged to Eastern Airlines (I worked for them at the time in Aircraft Overhaul). The pilot was in his check ride to start working for the airline & they did an engine out at takeoff. When the FAA examiner pulled the engine, the pilot lost control & hit the end of the runway in a level attitude. The plane was a mess, front bottom of it was ripped up & mud was thrown all into the cockpit. 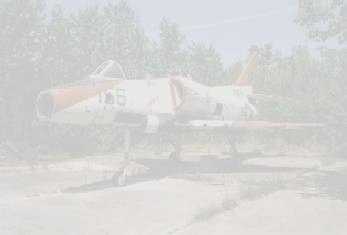 EAL dismantled the aircraft, pained over the logos & numbers & hauled it back on a flatbed. 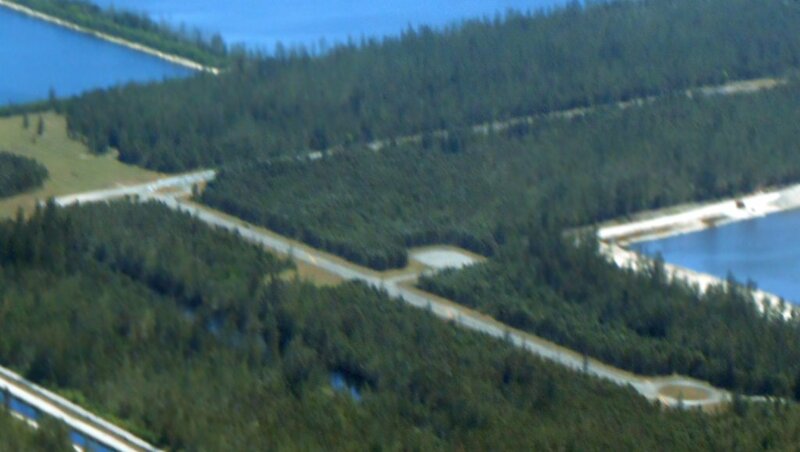 A 1995 USGS aerial view looking southeast at Dade Collier. Mark Williams recalled, “When I was training as a 727 Second Officer for the 'new' PanAm, we went out to TNT to do our bounces. According to Al, "Dade County aviation authority allows use of TNT by permit only, which are free to general aviation. Airlines have to pay a fee for each landing." He applied for & received the permit in 1997 through 2003. Al continued, "I fly there about once a week from North Perry Airport to shoot the ILS. I have encountered over the years in the pattern every type of commercial jet and prop aircraft. Even once a B-17 bomber using the surrounding area & airport for background footage for a motion picture. The US coast guard uses it regularly for practice 'drops'. General aviation uses it regularly for IFR practice. The airport used to be manned and open 24 hours a day, now it is closed from sunset to sunrise. ILS, LOC, inner & outer marker beacons, LOM." without resorting to much more expensive training flights in actual aircraft. leaving the field once again almost completely unused. but that is almost definitely an exaggerated figure. 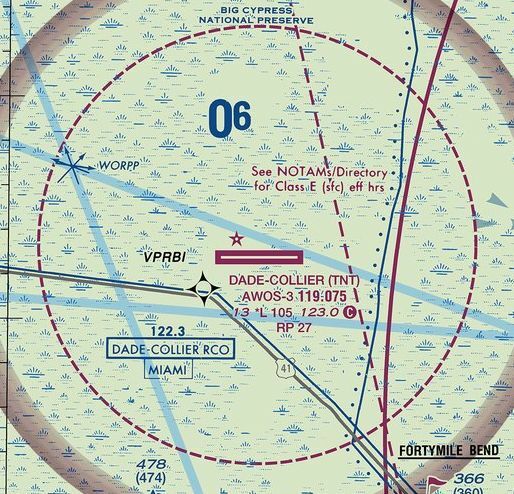 "Airport closed to public except by arrangement with Dade County Aviation Department Miami." A 12/13/04 aerial view looking southwest showed what appears to be a business jet taxiing to the east at Dade-Collier. 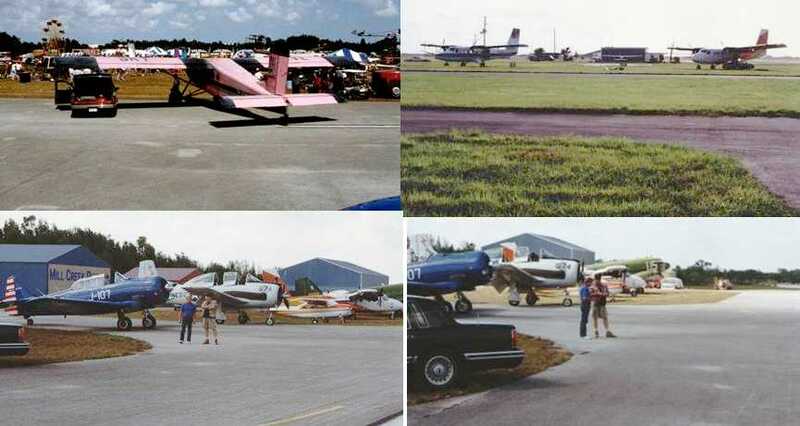 This is the earliest photo which has been located showing any aircraft at Dade Collier Training & Transition Airport. 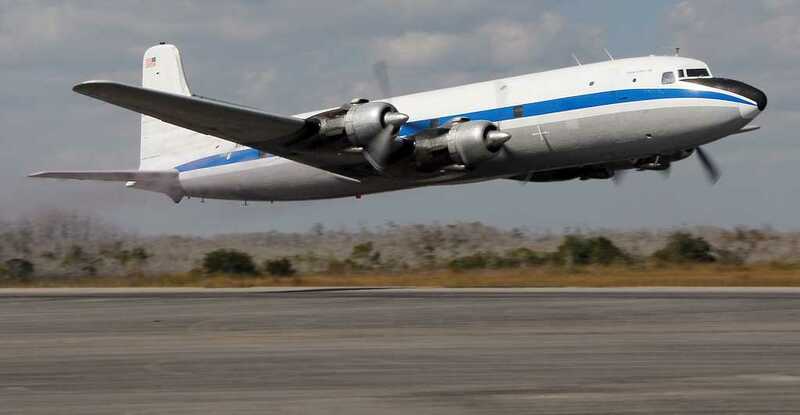 A 1/25/13 photo by Ralph Peterson of a DC-6A making a low pass down the Dade-Collier runway during testing of aircraft spray systems. 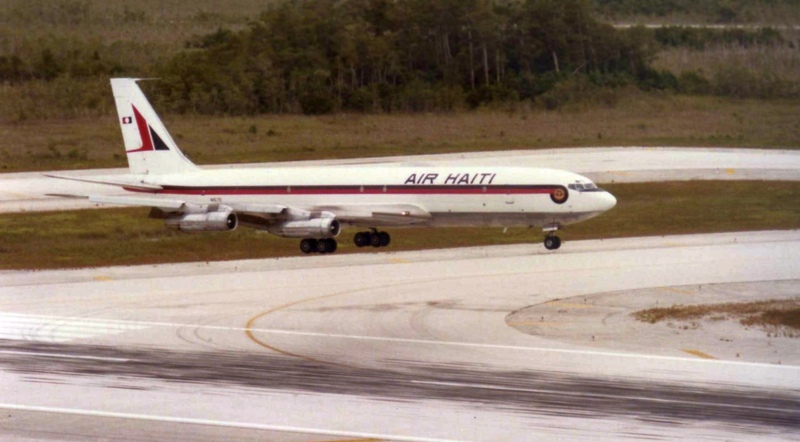 A 7/10/13 photo of a Boeing Air Haiti 707 on approach to the Dade-Collier runway during a training flight. 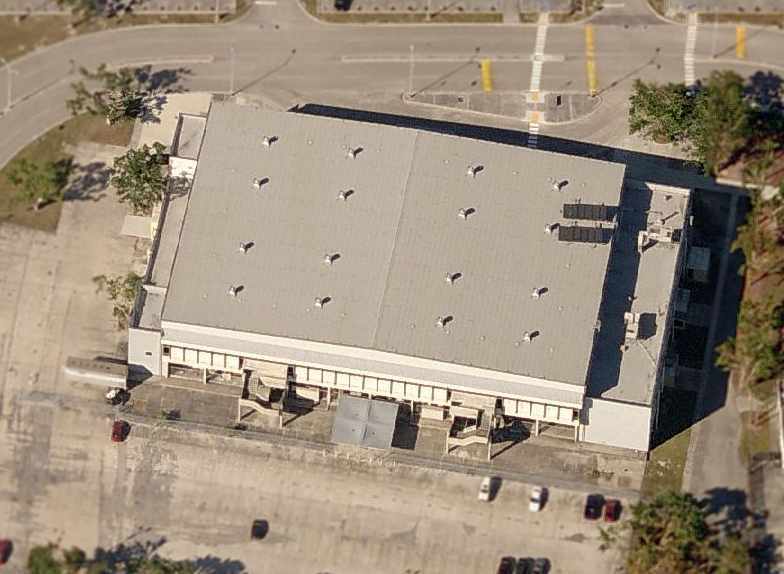 A 2014 aerial view looking southeast at Dade-Collier. A 2/27/16 photo by Mike Legeros of the Dade-Collier Airport gate. A 2/27/16 photo by Mike Legeros of the Dade-Collier Airport taxiway & runway, with an operations building on the left. having a single 10,500' paved runway.